RG Herald: Benavidez Sworn in to RGCCISD Police Department. Benavidez Sworn in to RGCCISD Police Department. 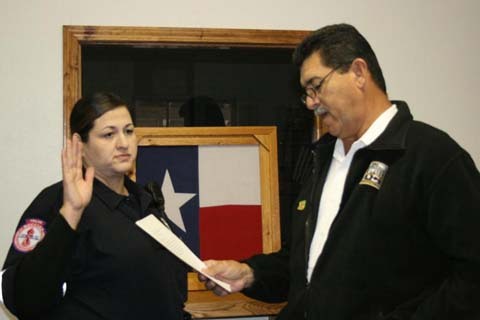 Mrs. Norma Nelly Moraida Benavidez was sworn in recently by RGCCISD Police Chief Hernan Garza. Benavidez attended the Mission Police Academy where she trained in all areas of police duties and attained a TCLEOSE (Police and Investigator Certification) from the State of Texas. She brings law enforcement experience working with juveniles through her employment as a Detention Officer at the Juvenile Justice Center for the past 2 1/2 years. Benavidez has held many hats in her lifetime which have given her a extensive perspective on the needs of others. Her previous accolades include working to insure that policies were in place that would positively impact migrant families and later she attended UCAS (University of Cosmetology Arts and Sciences) where she obtained her Cosmetology Instructor's License. She also worked briefly as a Cosmetology Instructor at Vogue College. Benavidez will undoubtedly be an asset to the RGCCISD Police Department. Mrs. Benavidez is married to Victor M. Benavidez and they have three (3) children, Victor Jr. -20 (Attending the Police Academy), Victoria C. -11 (Veterans Middle School) and Norma Valeria-10 (General Ricardo Sanchez Elementary). (RGCCISD Photo).